Following Jacksonville State’s shocking Thursday night loss to UT Martin, the Govs are tied with Belmont at 9-2 in league play. Austin Peay sophomore sensation Terry Taylor is closing in on one of the most significant numbers in college basketball—he’s 21 points away from becoming the 36th member of the 1,000-point club at Austin Peay. Three-pointers will likely be flying on both ends of the floor when the Panthers viist the Dunn Center on Saturday; Eastern Illinois hits 37.4 percent from deep, second-best mark in the league, but surrenders threes at a 38.7 percent clip, with opponents averaging more than nine makes per game. And the Govs are no slouch from deep as well, leading the OVC at 37.9 percent with nearly eight makes a night. The Panthers protect the rim, tallying 95 blocks through 24 games, the 79th-highest in the nation. Terry Taylor, who has averaged 2.0 three-pointers per game on 40.0 percent shooting over his last four outings, will need to drag his man away from the basket to open up driving lanes for Steve Harris, Chris Porter-Bunton and others. Josiah Wallace, who leads the Panthers at 15.5 points per game, puts up plenty of shots (315, 82nd nationally) but he’s not your run-of-the-mill chucker; he’s one of just four qualified shooters in the OVC to hit 40 percent from the field (41.6), 35 percent from three (36.3 percent) and 80 percent from the free-throw line (80.2 percent). The Governors rallied from an early deficit, built up a 14-point lead with less than ten minutes to play and then watched it all go away in an 85-83 loss to Eastern Illinois, January 19th, in Charleston. In a rarity during the Matt Figger era, the Govs were outrebounded by 15 and the Panthers’ Shareef Smith scored Eastern Illinois’ final 10 points, including a jumper in the lane with less than three seconds to play which ultimately provided the difference and offset a career-high 24-point performance from senior Chris Porter-Bunton. A victory would be the Govs third straight home win against the Panthers. The Govs are averaging 95.0 points per game at home this season, going 7-1 in those contests. Senior Steve Harris is averaging 12.8 points on 55.3 percent (26-of-47) shooting, 3.0 rebounds and 1.1 steals over the last five games. A win would make Austin Peay 3-0 to start February for the first time since 2007-08. Over the last 16 games, the Govs are shooting 50.4 percent (493-of-979) from the floor, going 13-3 in those contests. 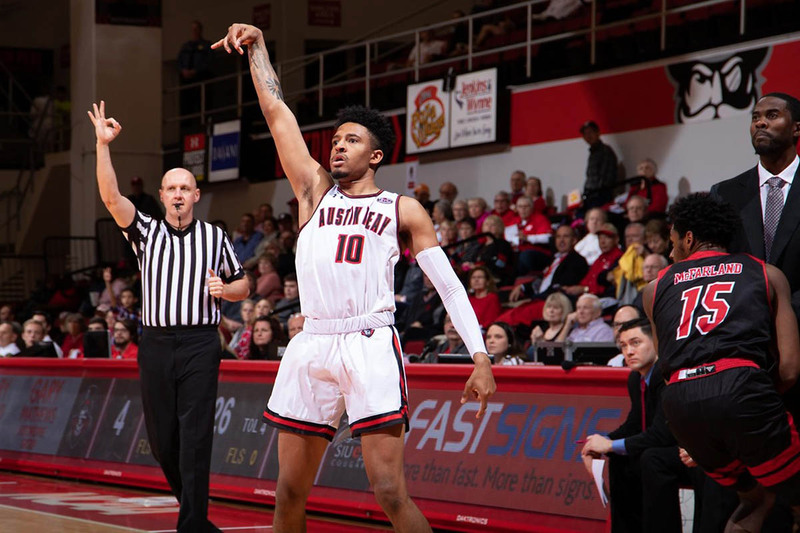 Austin Peay’s streak of 40 percent shooting nights has now reached 21 consecutive games, most since electronic record-keeping began in 1999-00. Taylor is averaging 23.3 points on 56.1 percent (37-of-66) shooting and 7.0 rebounds over the last four games, splashing in 2.0 three-pointers on 40.0 percent from deep. A victory would make the Govs 8-1 at home, their best nine-game home start since 2007-08 (8-1). Graduate transfer Jabari Mcghee is averaging 11.3 points on 57.7 percent (15-of-26) shooting and 5.3 rebounds the last three games. From late in the Tennessee Tech contest through the second half against SIU Edwardsville, the Govs went more than 70 minutes of game time without surrendering a three-pointer. A win mark Austin Peay’s best 12-game start to OVC play since 2007-08 (10-2). Freshman Antwuan Butler’s 2.5-to-1 assist-to-turnover ratio leads the Ohio Valley Conference. Check back at LetsGoPeay.com and on Austin Peay’s Official Athletics Facebook page often for up-to-date news about all Governor athletics, as well as the Governor men’s basketball Twitter page (@AustinPeayMBB). Live stats will be available during the game at PeayStats.com, and all home games and Ohio Valley Conference games can be viewed on the ESPN+ app. Postgame video interviews and other videos from around APSU Athletics can be found on our YouTube page (www.youtube.com/letsgopeay).